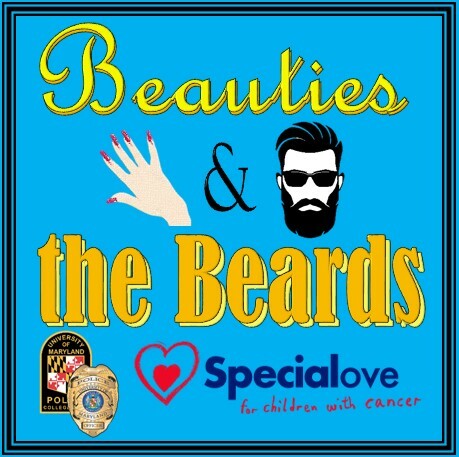 It’s November and you know what that means…the University of Maryland Police Department’s Beauties and the Beards event, also known as No-Shave November. For those who might not know, No-Shave November is a month-long journey where participants forgo shaving and grooming in order to evoke conversation and raise cancer awareness. The goal of No-Shave November is to grow awareness by embracing our hair, which many cancer patients lose, and letting it grow wild and free. 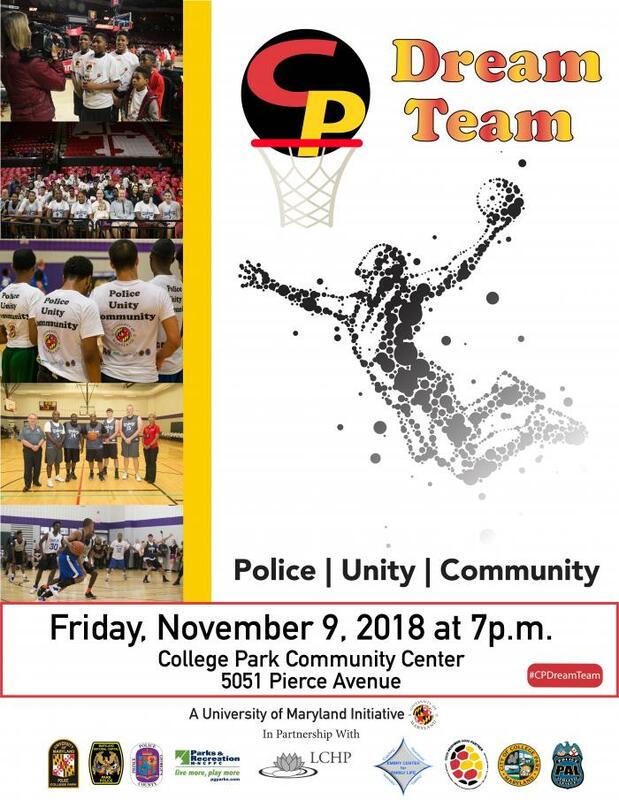 All proceeds raised by members of the University of Maryland Police Department in the month of November will benefit a local organization called, Special Love, Inc.
Special Love is a nonprofit organization that provides cancer families a community of support, made up of other patients and families who know and understand the trials and triumphs of the cancer experience. Special Love strives to bring together children with cancer and their families for fellowship, friendship, and fun. Families on the pediatric cancer journey have an ally during and after the cancer experience. Each family member is included in programs: Family weekends give mom and dad a chance to share with other adults, and siblings have a program that gives them the attention they need and an opportunity to make their own friends. Hospitals refer the families of children with cancer to Special Love. The communication among the patient, doctors, family, and Special Love staff assures the best interests of the child with cancer are well-represented and everyone has an understanding of the patient’s needs. Traditionally, No Shave November is known as a men’s only event. However, the University of Maryland Police Department (UMPD) wants all of their employees to have an opportunity to participate. That is why all members of the police department will have the option to either grow their beards out or paint their fingernails in extreme or unnatural colors. To donate to Special Love, Inc. click here. If you wish to learn more on How a Community Makes a Difference, watch this short video here. So, if you see any of our police officers, staff or student police auxiliary members with bright color fingernail polish or more facial hair than usual, it’s because they are raising cancer awareness. 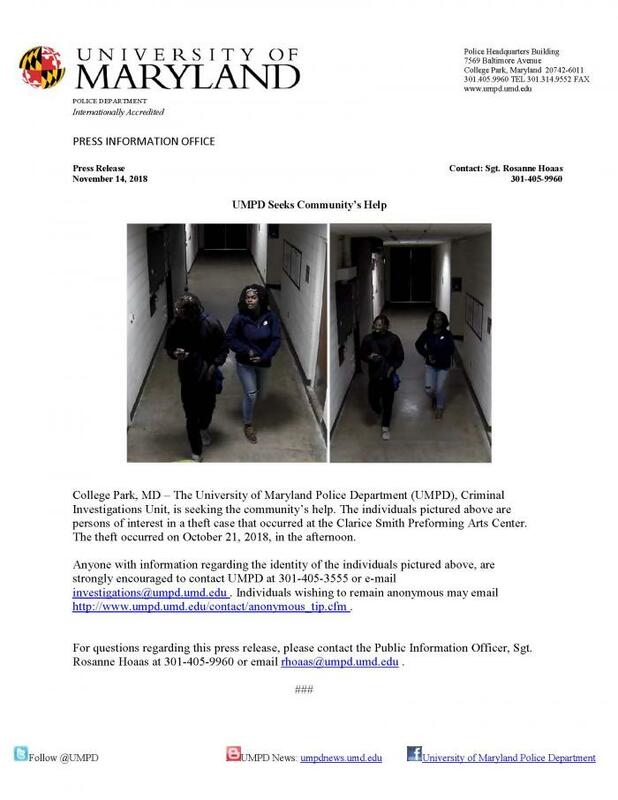 OCCURRED: November 6, 2018/ Approximately 11:50 a.m.
On November 6, 2018, at approximately 2:33 p.m., the University of Maryland Police Department was notified of an indecent exposure that occurred earlier in the day, off-campus. A female UMD student reported to the Prince George's County Police Department that at approximately 11:50 a.m., she was walking towards the University when an unknown male in a vehicle, offered her a ride. The student accepted the offer. The driver turned onto Lakeland Road from Baltimore Avenue, parked the car and exposed himself. The student exited the vehicle and ran away to safety. We write to you to make you aware of various scams that have been reported in our area. There are different methods a scammer will use to contact a potential victim. The scammer may call, send an email or might even approach the potential victim in person. The goal of the scammer is to use fear or pity to try to convince the potential victim to comply with the scammer’s demands. If someone you don’t know mails you a check or approaches you in person and asks you to cash a check for them; don’t. It’s a scam. If someone you don’t know asks you to cash a check and use a wire transfer service to send the money back to them after cashing the check for them; don’t. It’s a scam. You receive a call from a scammer claiming to be from a government agency (federal, state, or local) and you need to make a payment in order to avoid being jailed, deported, fined, or that you owe taxes; or a family member is in need of help or tech-support and they demand gift cards in the form of payment; don’t. It’s a scam. Gift cards are for gifts, not payments. The IRS will never call to demand payment, such as prepaid debt cards, gift cards or wire transfer. The IRS will first contact you via the mail with a bill to any taxpayer that owes taxes. If you find yourself on the phone with a scammer, hang up. Asked to Pay by Gift Card? Don't. The IRS is Calling Me? Is this for Real?